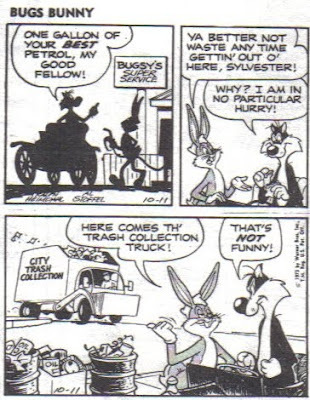 Let's Look: "Looney Tunes"(DC) #75, 2001: "Who Killed Bugs"? 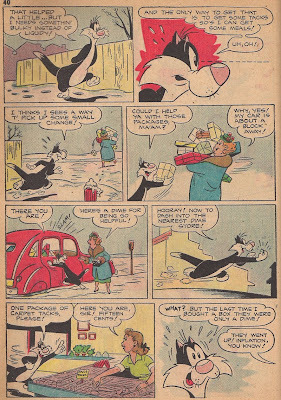 Since you readers seemed to like my trial run of taking a look at a full issue of a comic on video, here's a look at one of my favorites, and one many of you have requested that I do a post about. 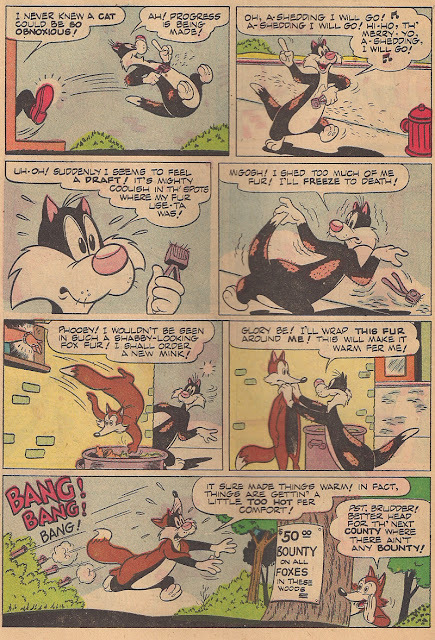 It's issue 375 of DC Comics' "Looney Tunes", a full-issue masterpiece by Dan Slott and Dave Alvarez. I know it's been a while since I updated this blog, so I wanted to remind everyone that it's still here by trying something a little different. 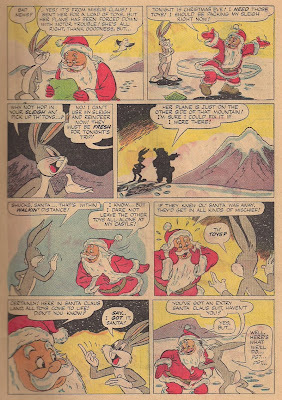 I post stories from Looney Tunes comics for you all to read, but I thought it would be fun to do a video and show you one of the books themselves. 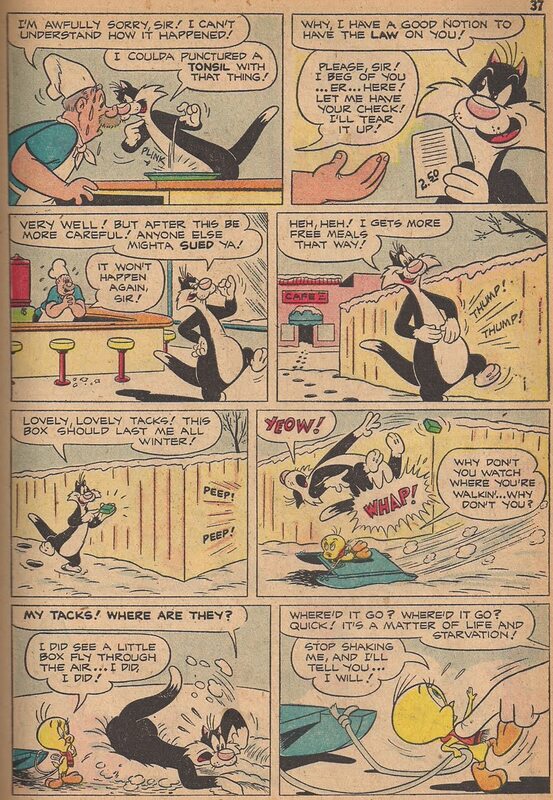 Now you can take a look at an issue and get a feel for what it's like to flip through one. 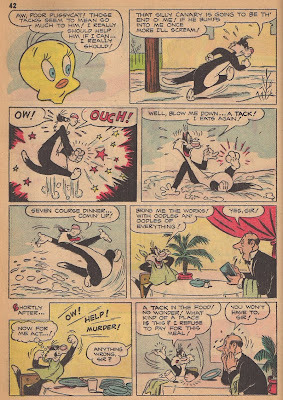 If you want to see more, please let me know, and I'll try to make this a regular 'thing", as I mentioned in the video below. 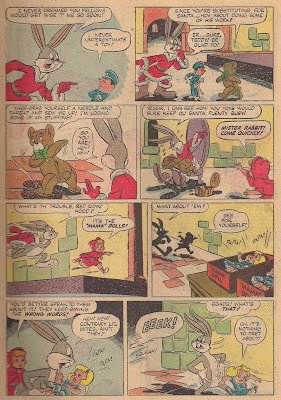 "Looney Tunes and Merrie Melodies"(Dell) # 99, January 1950: ""Bugs in Toyland"
In this strange Christmas tale from 1950, Bugs Bunny buys a carrot as a gift for his girlfriend Lula Belle, but when he sees her buying an expensive watch, he assumes it's for him and decides he needs to come up with a better present. 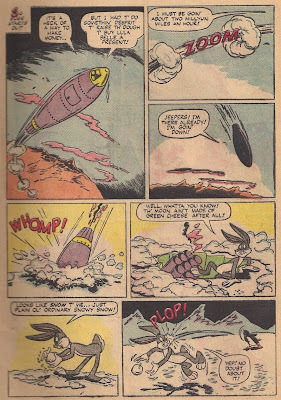 He stumbles upon two scientists who need a test subject for their rocket launch to the moon. Their offer to pay entices Bugs to agree, but the rocket doesn't make it to the moon. 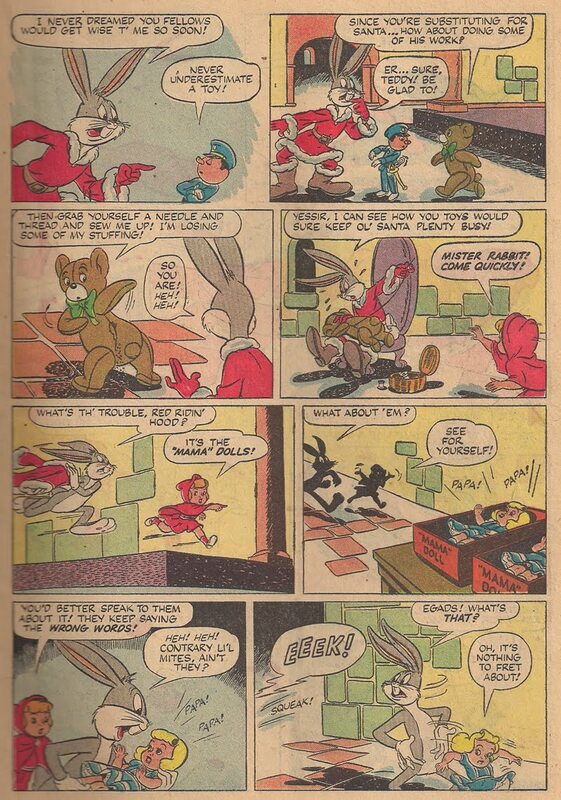 Instead, it crashes at the North Pole, where the rabbit discovers Santa Claus in a bit of a conundrum. 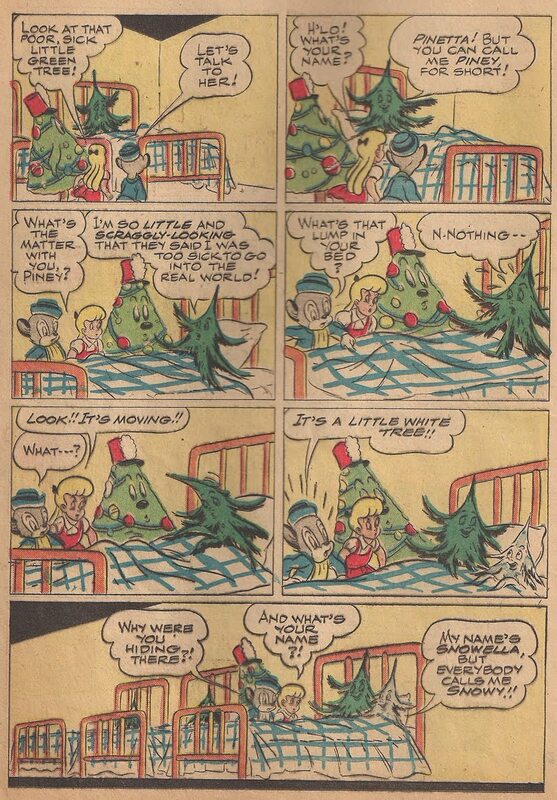 It gets weirder from there. 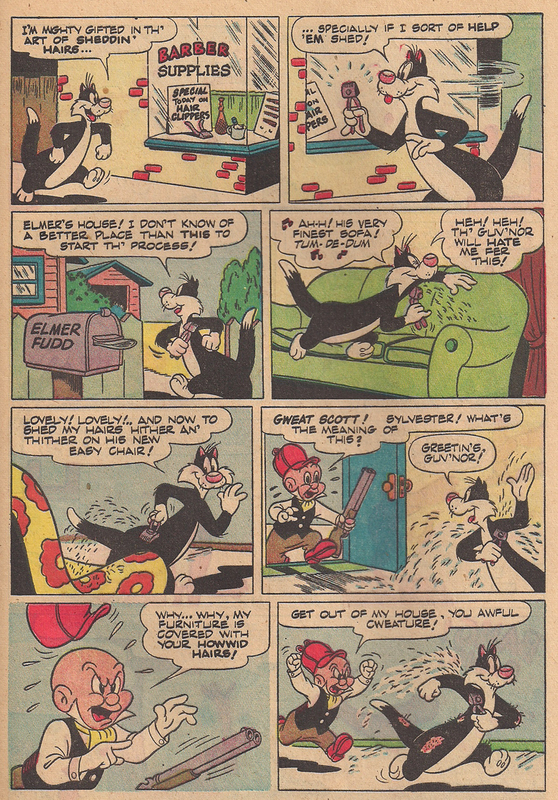 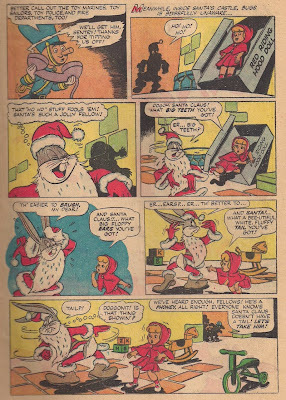 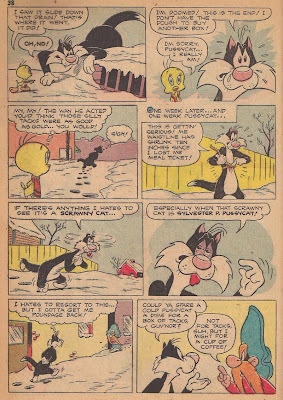 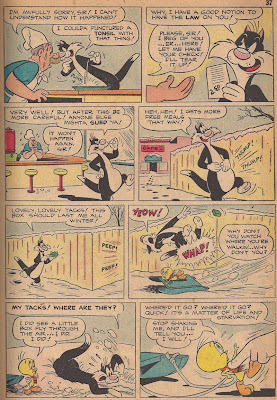 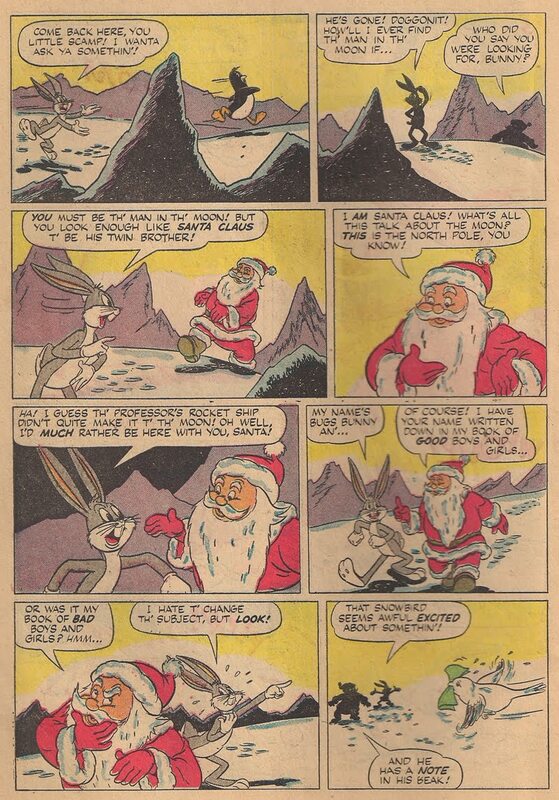 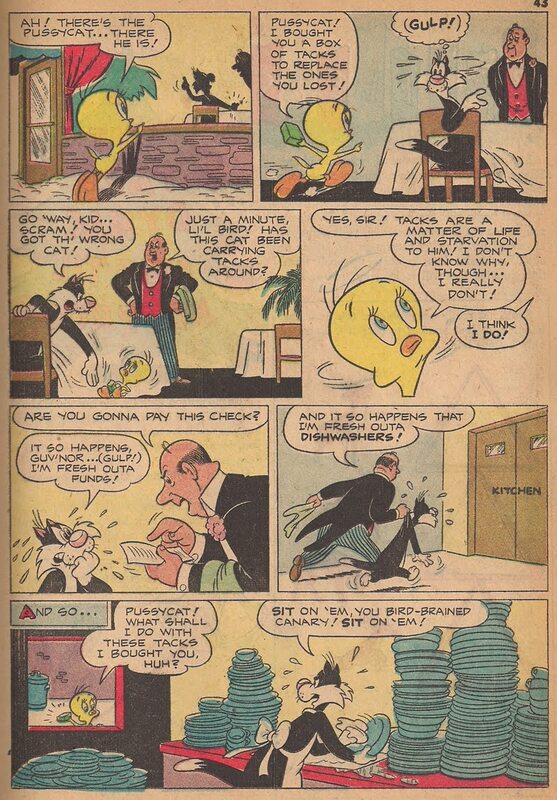 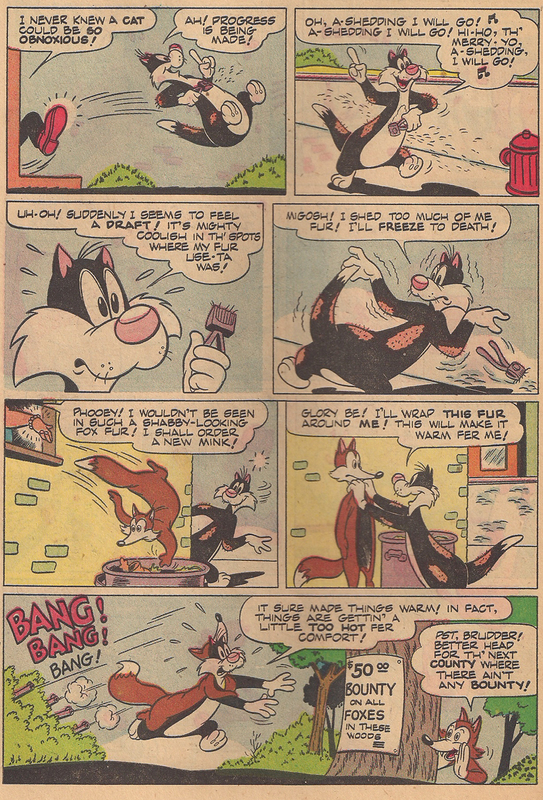 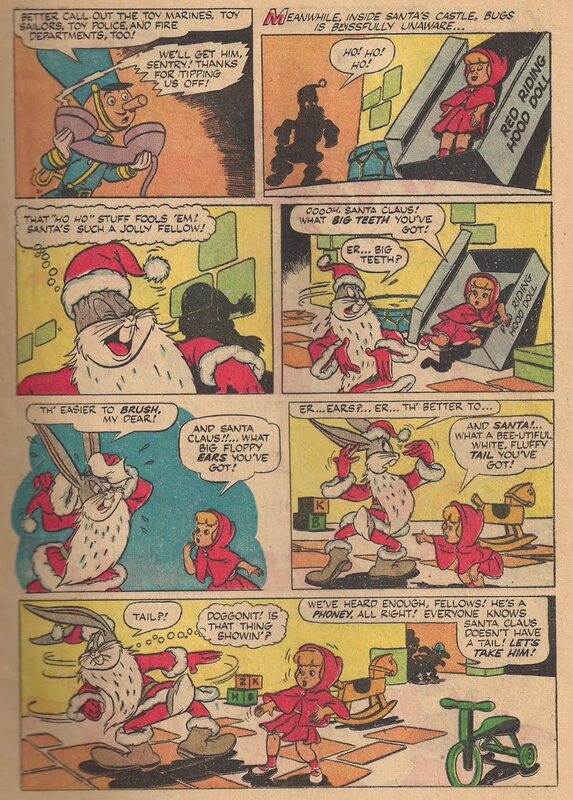 "Bugs Bunny's Christmas Funnies"(Dell) # 2, 1951: "Sylvester and Tweety"
Dell often produced thick, jam-packed annual Christmas specials featuring their various comics properties. 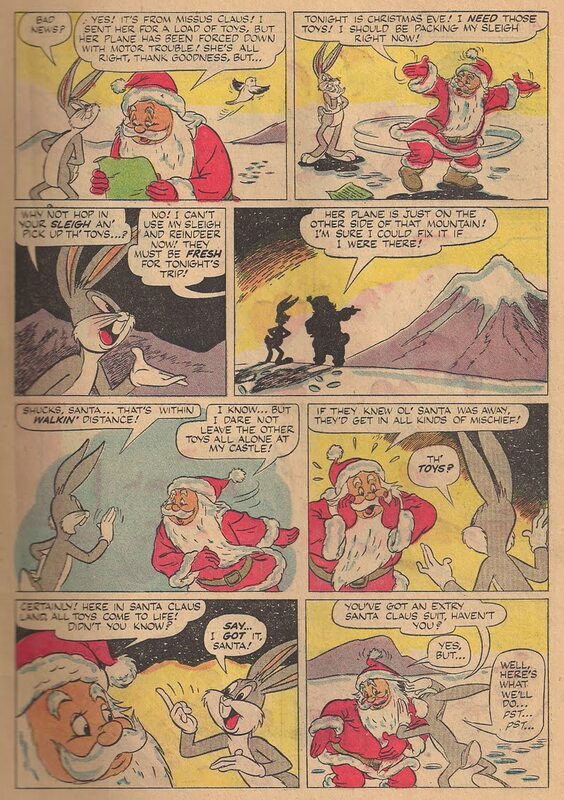 For the Warner stuff, it was "Bugs Bunny's Christmas Funnies". 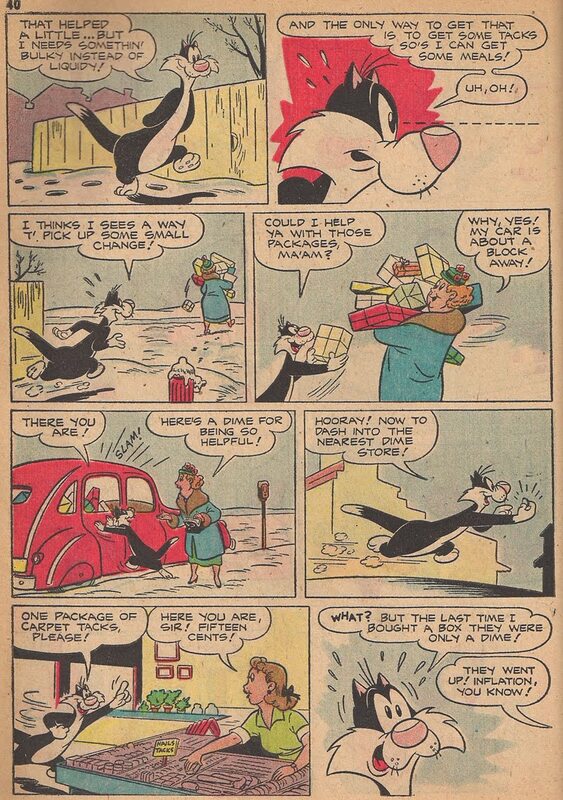 In this story from the second of those, Sylvester thinks he's got a free meal ticket for the entire holiday season. 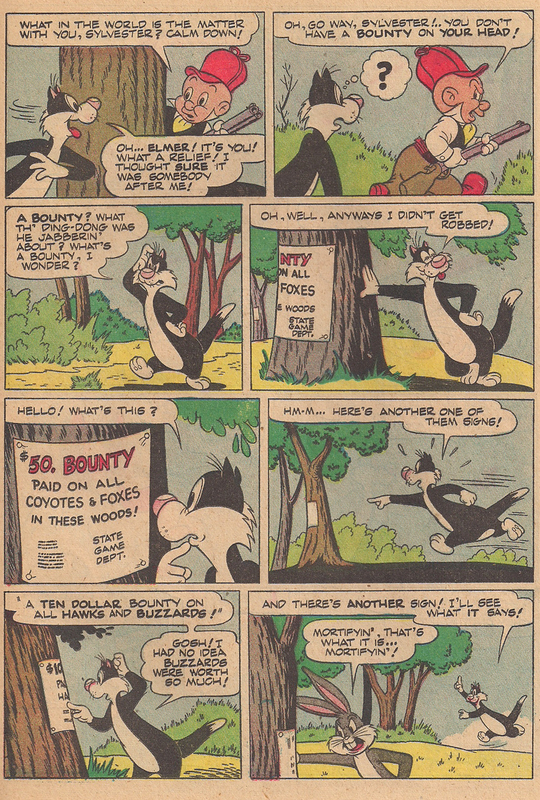 His scheme? 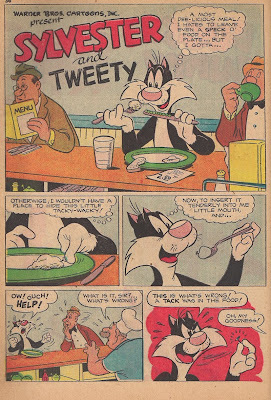 Ordering food at a restaurant, and, just before finishing, placing a tack in it and blaming the waiter, thus getting his meal comped. 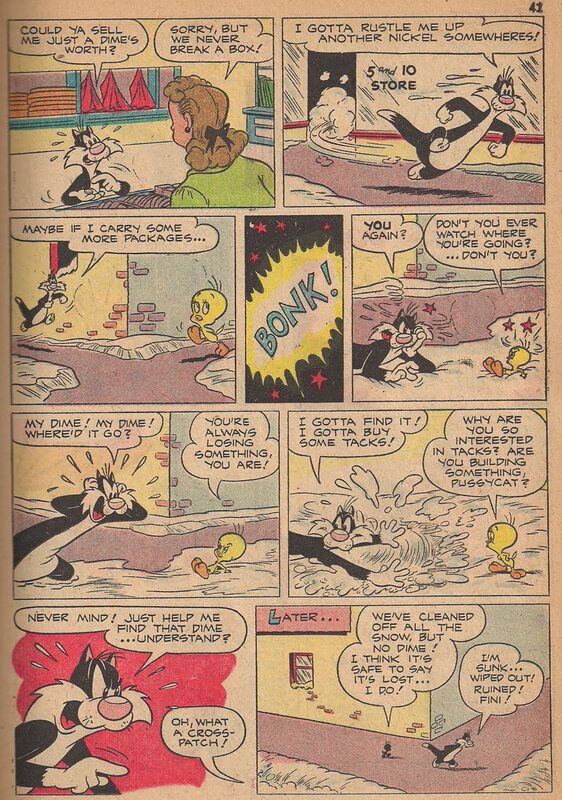 It all goes according to plan, until Tweety causes him to lose his box of tacks! There are some wonderfully expressive drawings of Sylvester in this one. Oddly enough, he seems so focused on his scheme, and distraught when it goes awry, that he never thinks of eating Tweety. 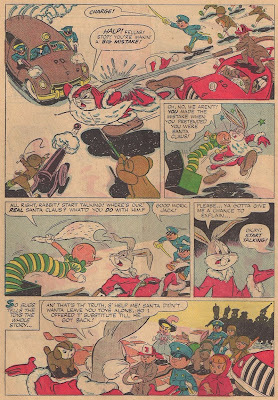 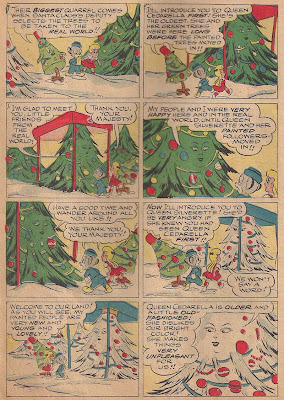 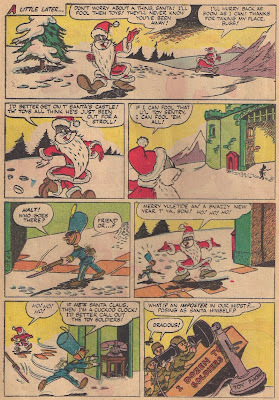 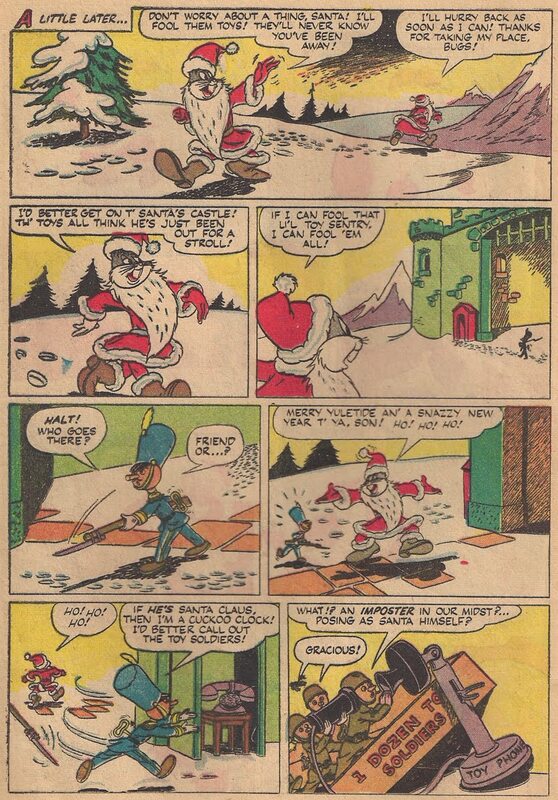 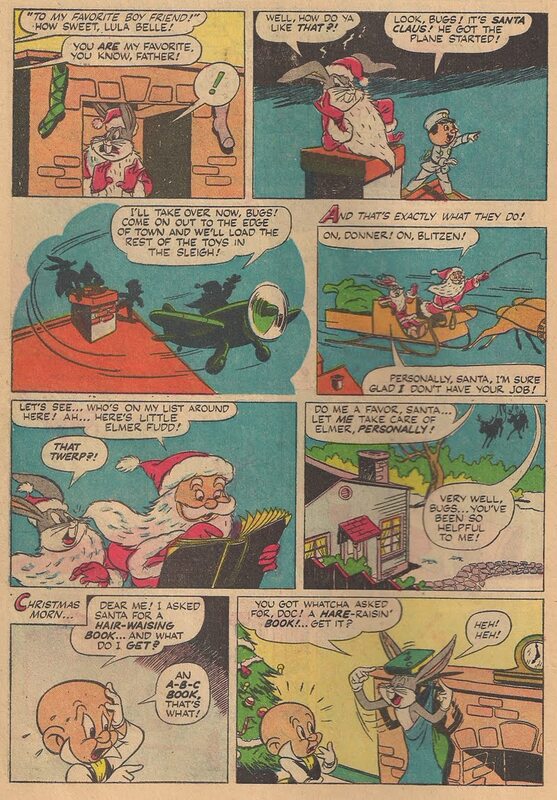 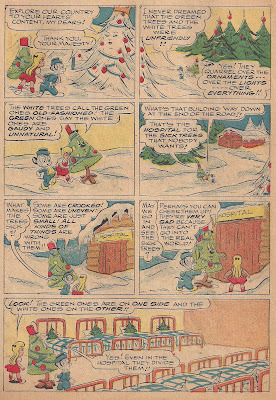 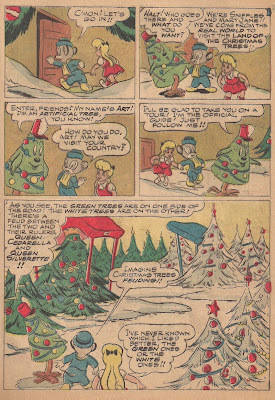 "Looney Tunes and Merrie Melodies" (Dell) # 39, January 1945: "Christmas Tree Feud"
The Dell/Western Publishing comics, not just the Looney Tunes series, had tons of Christmas-themed stories and specials. 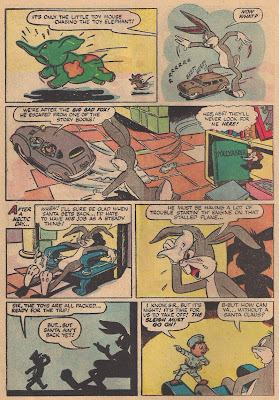 This month, after taking a break from this blog for a while, I plan to showcase some of my favorites featuring the Looney Tunes characters. 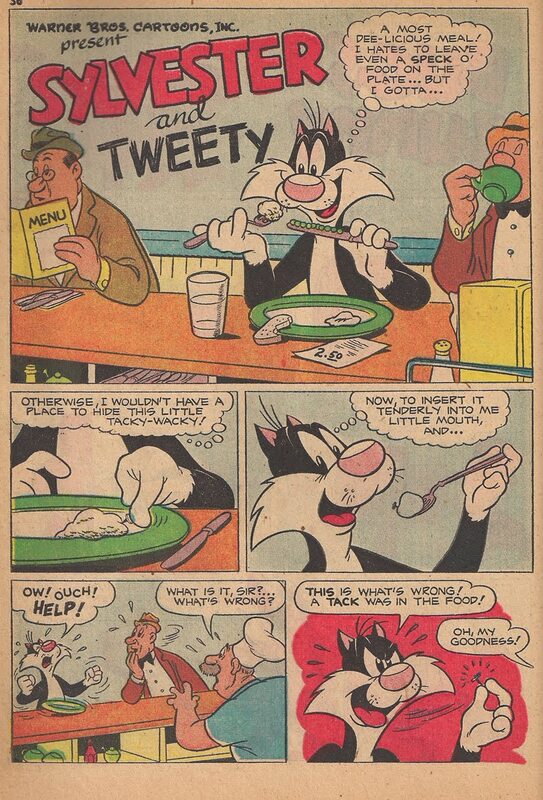 Some are funny, some are sweet, and some are just plain bizarre. 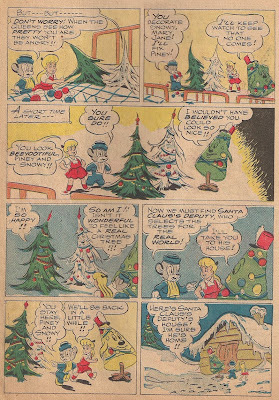 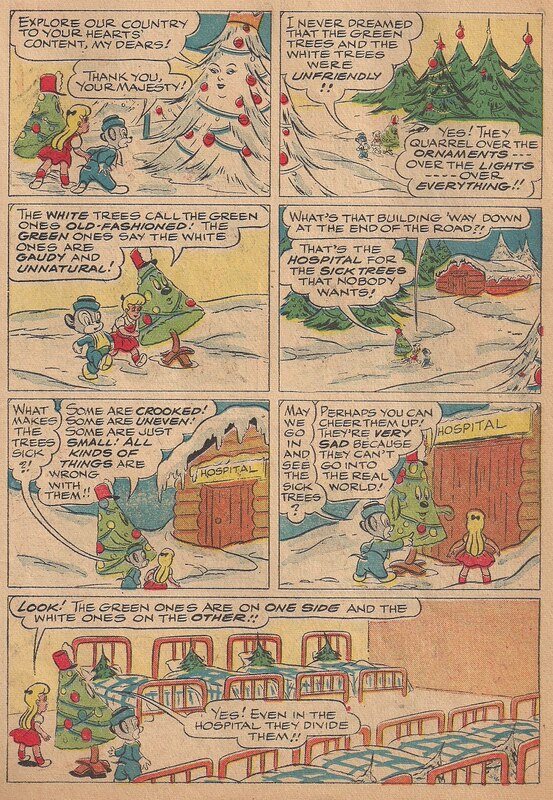 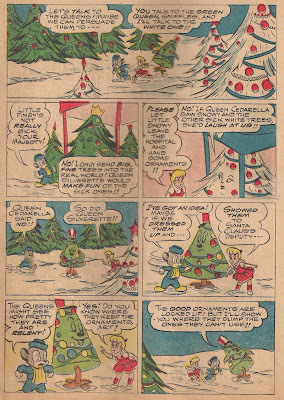 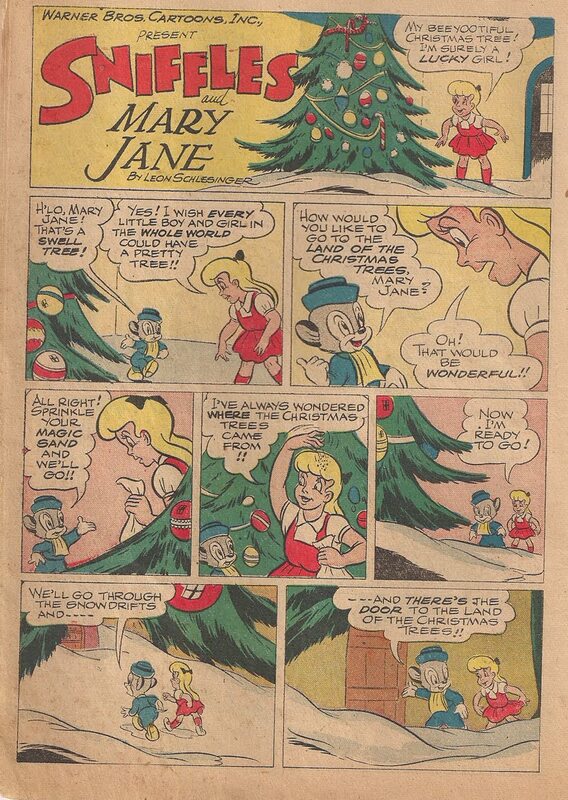 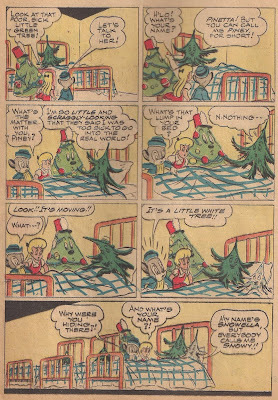 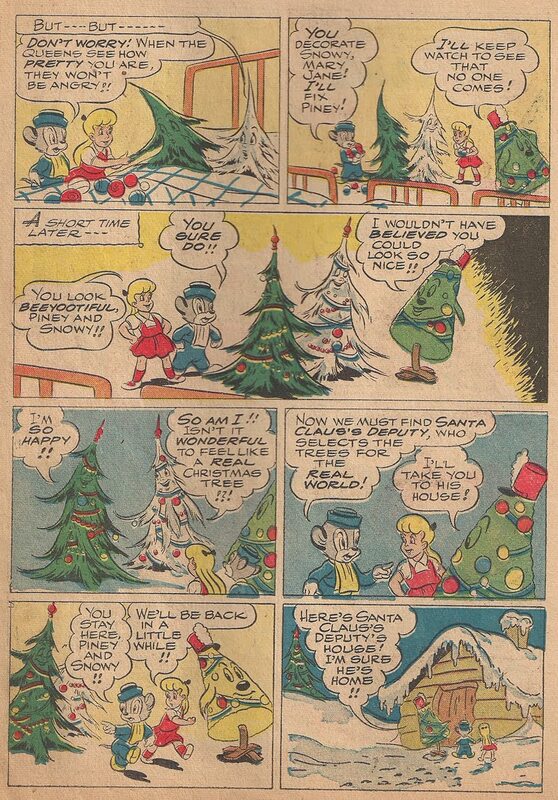 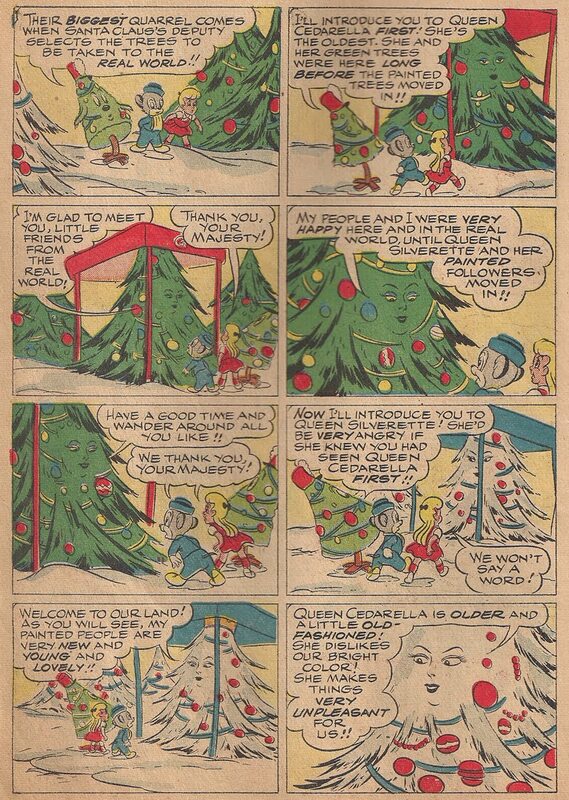 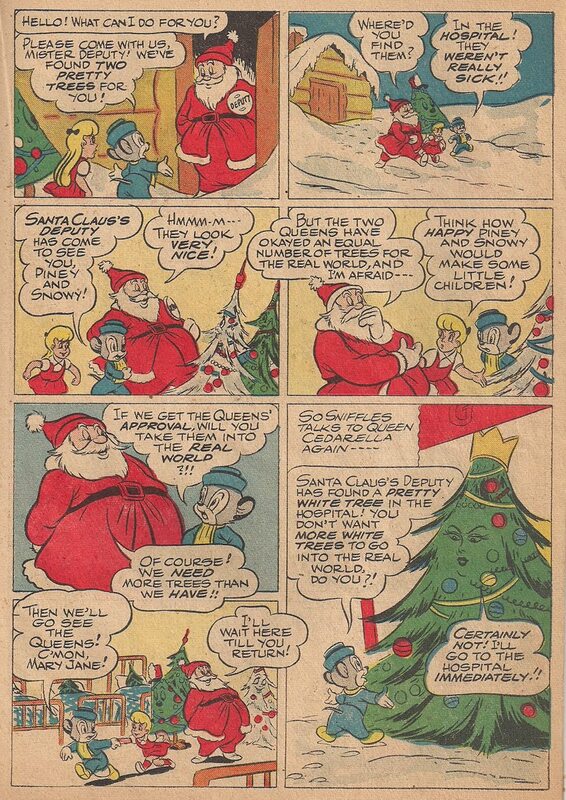 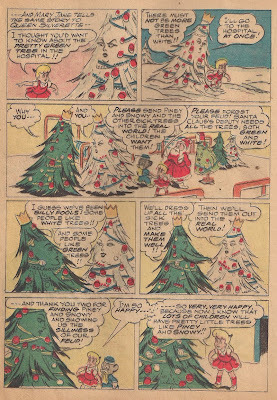 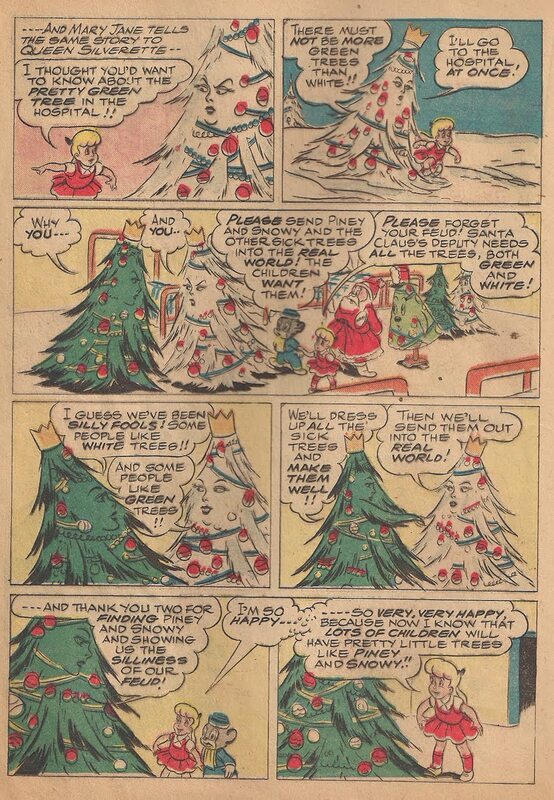 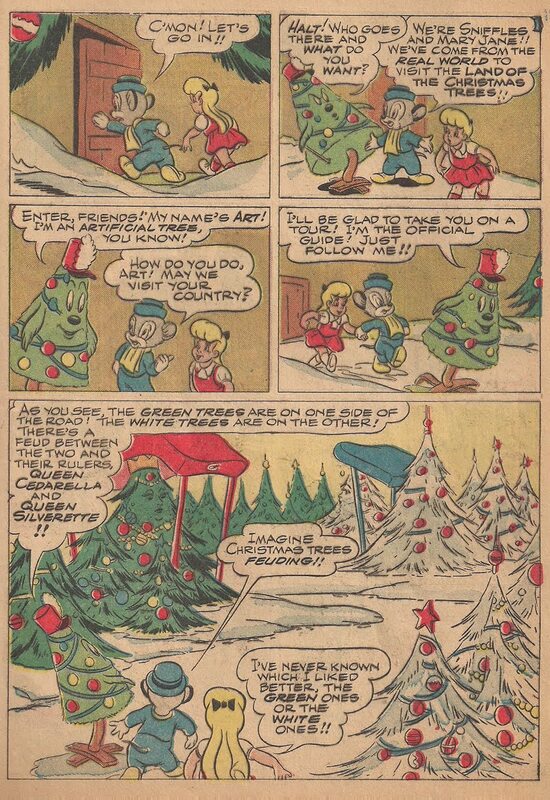 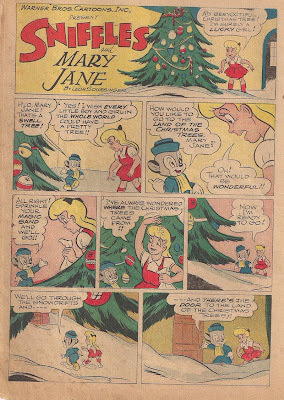 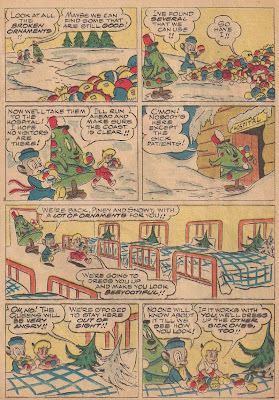 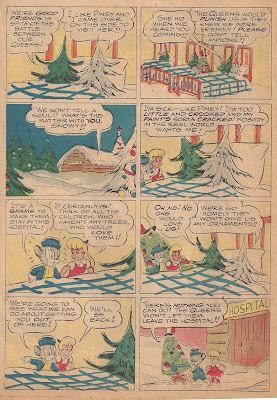 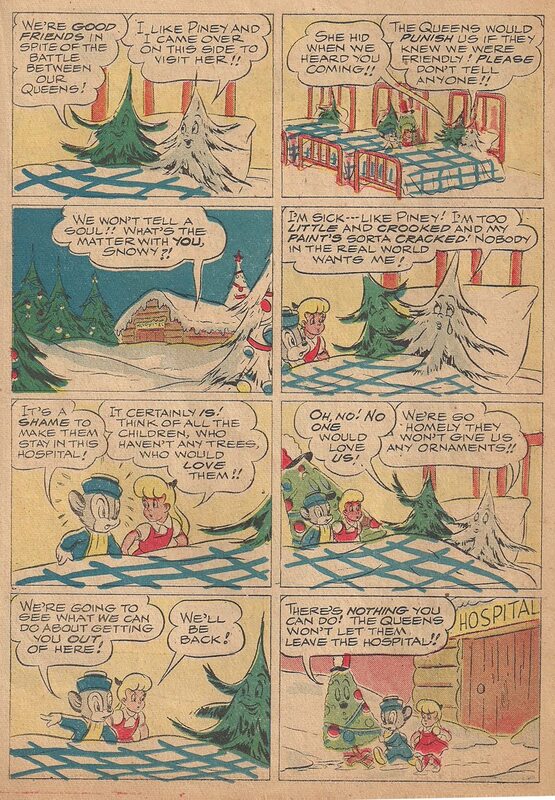 In this one, from 1945, Mary Jane and Sniffles enter the fantasy world of Christmas trees. 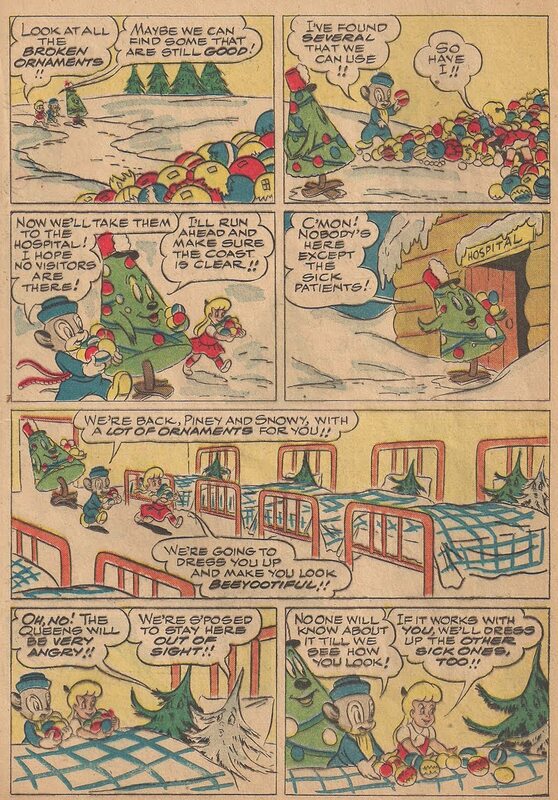 All is not well in this world, because the natural green trees and the fake-snow flocked trees are feuding. 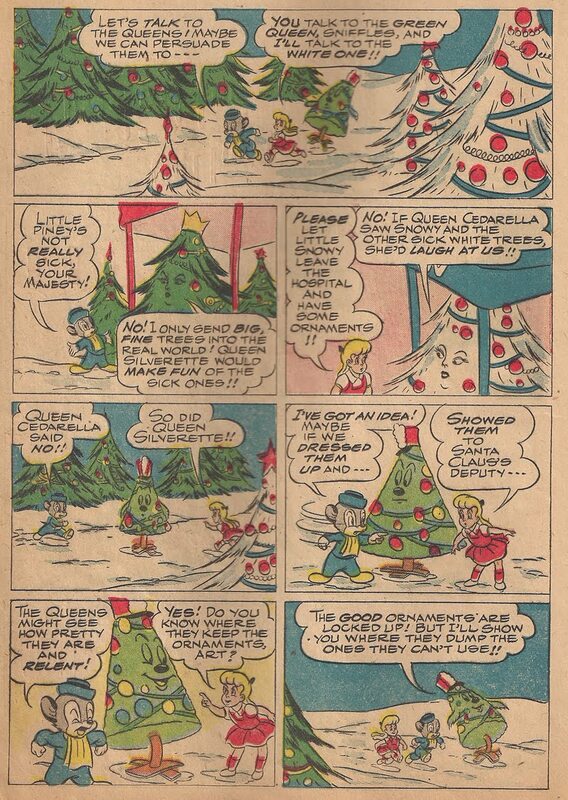 As bizarre as it sounds, it has a good message, and is really an appealing Christmas fantasy worth the 11-page read. "The Bugs Bunny comic strip was syndicated by Newspaper Enterprises Association, whose comic strip titles include, but not limited to, Eek & Meek, Arlo & Janis, and Alley Oop. It ran in newspapers from 1942 to 1993. 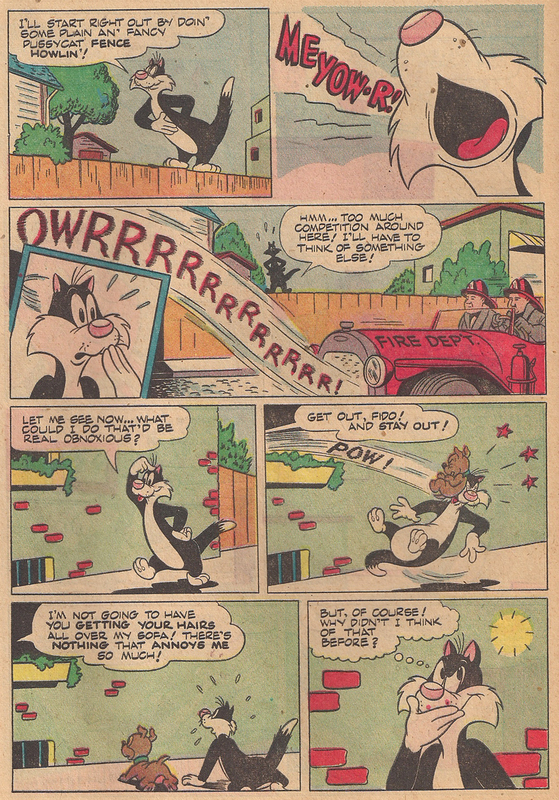 Various artists have worked on the strip, including Chase Craig, Roger Armstrong, and even Tom McKimson. 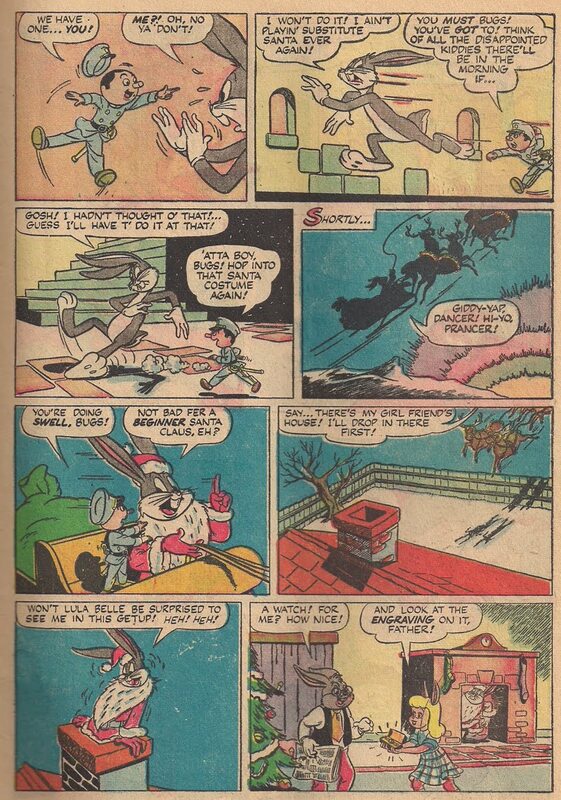 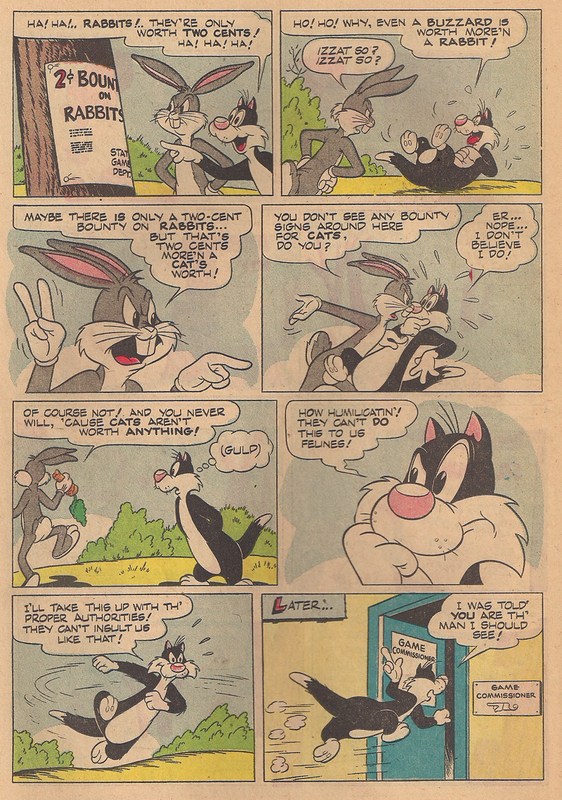 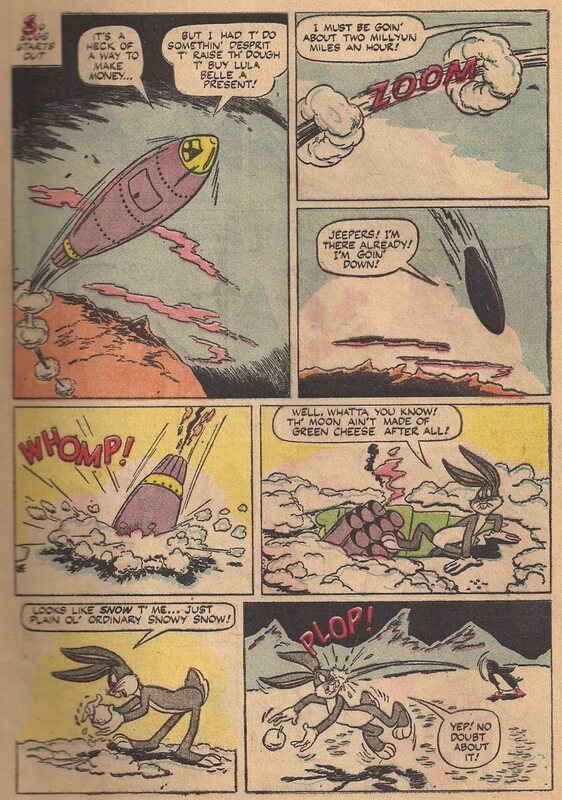 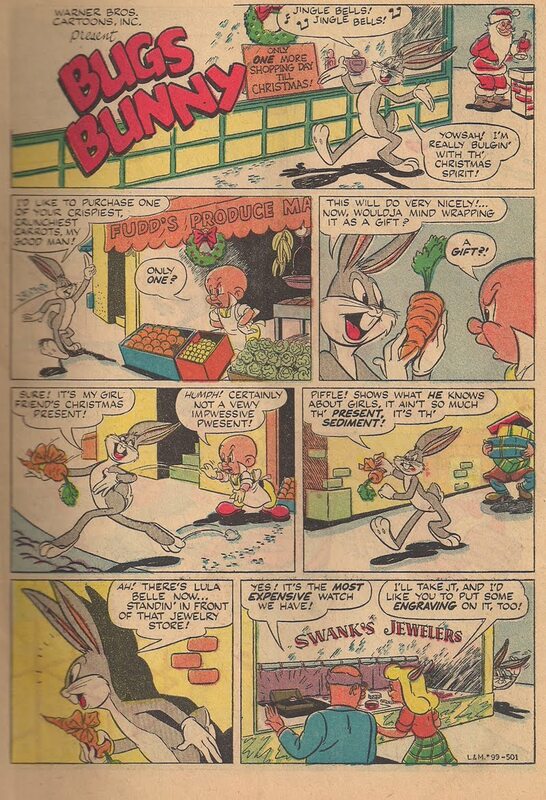 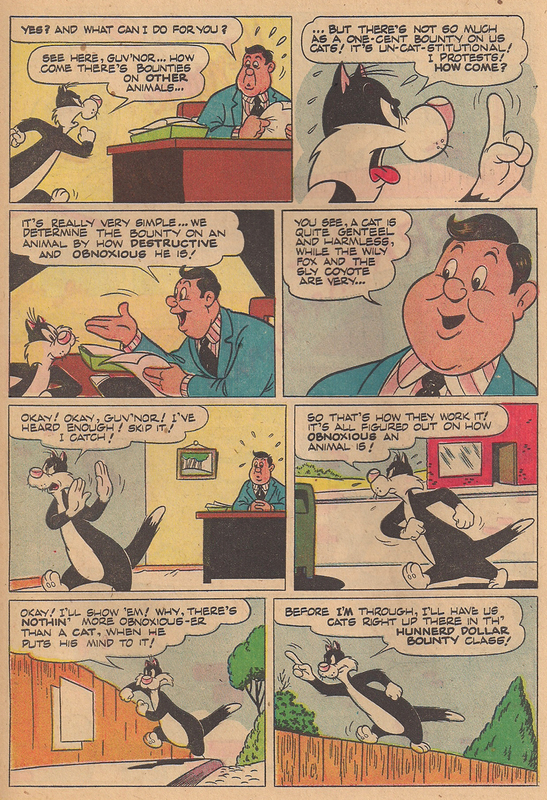 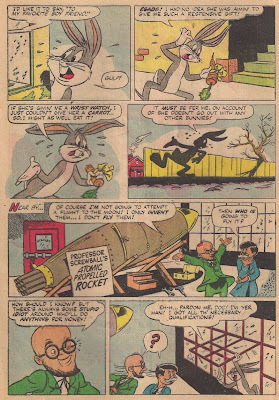 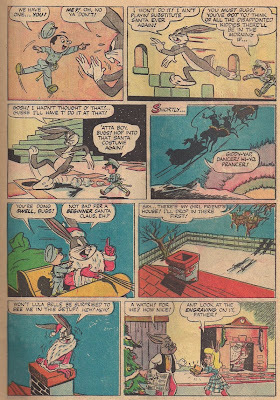 Bugs Bunny comic strips posted here are from 1973, and were drawn by Ralph Heimdahl and written by Al Stoffel. 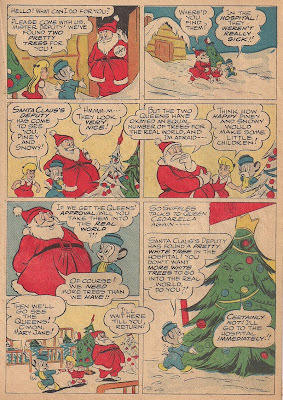 They were scanned from Menomonee Falls Guardian, which ran the strip as fillers." Clearly, Heimdahl and Stoffel didn't understand Bugs or any of the other characters. Judging by these samples, their idea of humor was to place characters in a generic suburban setting, and the gags came from one character being mean to another. 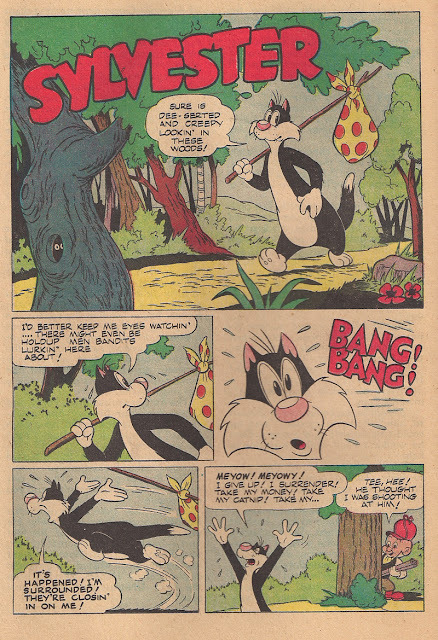 It's not too unlike the current "The Looney Tunes Show". 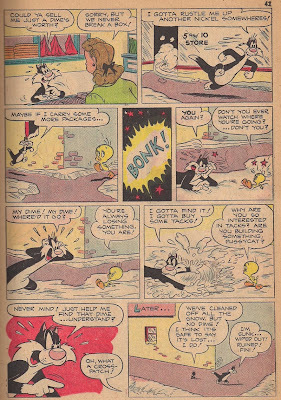 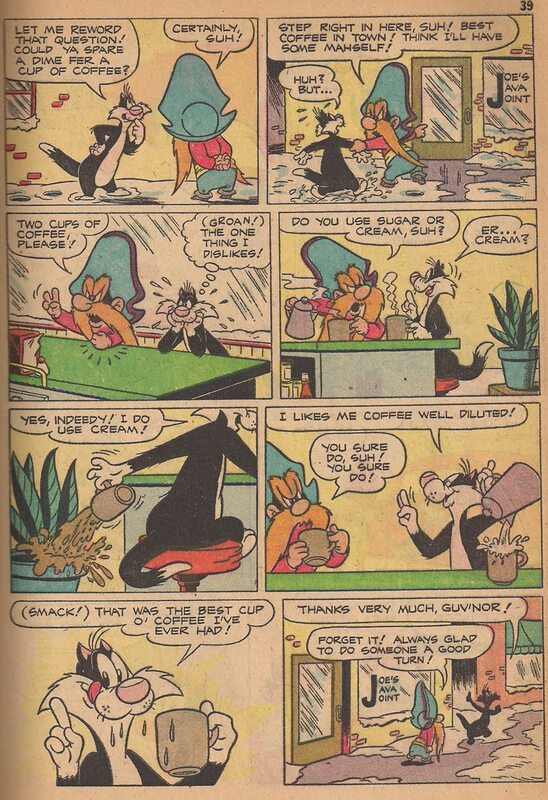 Note that some of the things Bugs does in these strips are much better suited for Daffy Duck, but Daffy never appeared in the strip. 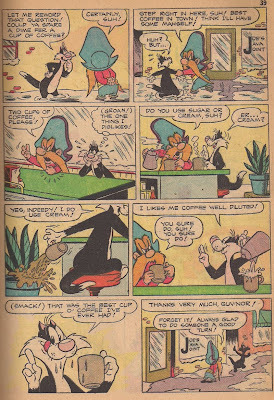 Heimdahl and Stoffel seemed content with just Bugs, Porky Pig, Petunia Pig, Cicero Pig, Elmer Fudd, and Sylvester. Click here to see these...if you're brave.